This week's theme is TAILS -"Springtime Memory". I have lots of Springtime memories... especially after moving to Missouri. Too many memories of sitting on my floor reassuring my fur-kids that 'It's O.K. It's just thunder. Calm down'. Yes, we get many storms. In fact, it has been raining here for three days. Saturday and Sunday involved thunder, rain, lightning, rain, HAIL, and... RAIN. As a result, we've got flooding. To top it off, the winds are supposed to get up to 40 MPH by this evening with windchills of zero. Can you say "black ice"? UCK. I'm tellin' ya - Mother Nature hates me! "Let's remember this Spring day forever, Sis. Give me a lil' kiss!" The good weather will come soon - I hope! I hope that better weather is just around the corner for you, and I will refrain describing our current weather. 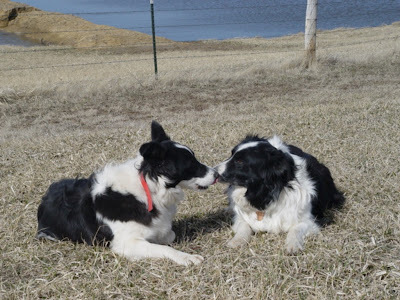 I just love border collies and yours are absolutely darling. My boy has spring fever and a case of wanderlust. What a sweet picture! We had bunches of thunder this weekend. The wind blew the shingles off my mom's house! Have a great day. Oh, soon, it will be spring!?! Woke up to six inches of new snow, the sun is shining and the temp is 4. Yes. 4. Sounds like you had a wicked storm! C'mon spring. Enough with winter already. Neat picture of nosing pups. I woke up to snow. Not much, but enough to make the truck a pain to drive for a while (I was running too late to clean it off). Now, sunshine. 18 degrees. It was fun watching the snow evaporate off of the roads on the drive in, though. Adorable picture! Is that an example of the flooding in the background, or a perpetual body of water? Snow storms here and thunder storms there...we both have to take a vacation! Where ya wanna go?